Leather look glove. Black Steering Wheel Cover. Simply stretches over existing steering wheel. Excellent low cost way of renewing an ageing steering wheel. Non-slip grippy inner lining. Thick & well made. This steering wheel cover adds comfort and grip to your existing steering wheel. 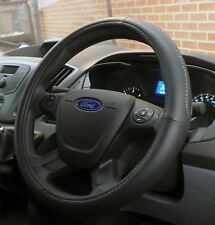 Tailored to the Transit Custom steering wheel, it's made from a stylish and soft leather look material. 1 Soft Leather,Mould proof, Breathe freely and absorb Sweat. 2 This steering wheel cover will protect and prevent wear on your original steering wheel. Steering wheel cover material: Genuine Leather. 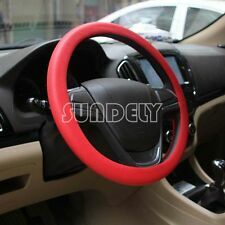 Real Leather Universal Steering Wheel Cover 15”/38cm - HIGH QUALITY (Black/Red). HIGH QUALITY Dee-Type Genuine Leather Universal Steering Wheel Cover 15 ” /38cm. Protects finish and value: Keep your car looking new / hide existing wear. Size: Fit for flying 14 "(36cm) to 16" (40cm). 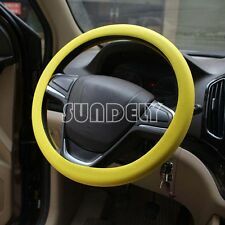 Car steering wheel cover 36-40cm Silicone Soft Cover. 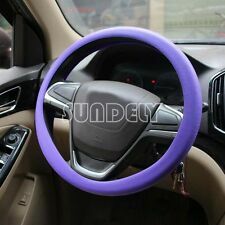 1 x Steering wheel Cover Car. Material : Silicone. Color: Green. FAUX LEATHER STEERING WHEEL COVER BLACK/RED. Replacing a worn steering wheel is expensive. Get a custom look and save a lot of cash by grabbing one of these covers. Looks and feels like real leather. Fits 37-39cm Steering Wheels. UNIVERSAL, SO WILL FIT MOST STEERING WHEELS. ADD THAT SPECIAL TOUCH TO YOUR CAR! Fits: Vauxhall Vivaro (2001-2014). 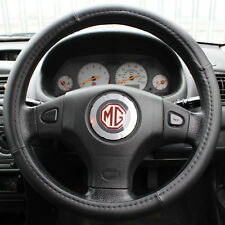 This carnaby black steering wheel cover adds comfort and grip to your existing steering wheel. Steering Wheel Cover in Black Cloth. (This is usually completed within 24 hours or so). Slips easily over steering wheel Fits all standard 15" steering wheels Soft comfortable grip Cool in summer, warm in winter. Universal Steering Wheel Glove. Simply stretch over your steering wheel for a luxuriant yet sporty look. Should fit to most modern cars. Vehicles with especially thin steering wheels may not be suitable. Ford Focus MK2 Stainless Steel Steering Wheel Trim. Ford Focus 2 MK2 2005 2007 2008 2009 2011. This high quality stainless steel steering wheel trim will add a high class finish to your Focus interior. 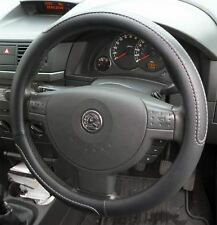 The leather look Steering Wheel Cover provides a comfortable grip and has contrasting white stitching detail. It will add a classy touch to your car interior. 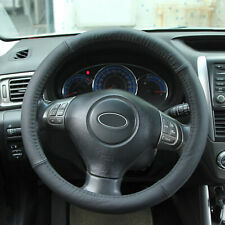 Real Leather Universal Steering Wheel Cover 15”/38cm - HIGH QUALITY (Black/Blue). HIGH QUALITY Dee-Type Genuine Leather Universal Steering Wheel Cover 15 ” /38cm. Protects finish and value: Keep your car looking new / hide existing wear. 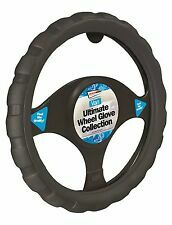 Improve the appearance of your old or cracked steering wheel. - Installation is simple, durable. - Fit all cars. Detail Image. We will try our best to reduce the risk of the custom duties. FIESTA ST 2009 to 2015. STEERING WHEEL INSERT BADGE UPGRADE. A cool upgrade for your pride & joy. Simply peel and apply to a pre-cleaned surface. BMW 3 SERIES E90 & E92. STEERING WHEEL CARBON FIBRE DECAL UPGRADE. New quality carbon fibre and epoxy decal. Simply peel adhesive tape cover and apply to a pre-cleaned surface. TO LEAVE A FAVOURABLE REVIEW AS A GUIDE FOR OTHERS. Breathable, comfortable and anti-slip sweatband Made of soft and durable PU leather material With thread and needle Great for replacing a damaged or worn original factory leather covered steering wheels. Best budget to meet your needs. Soft, clean, pore exquisite and comfortable handle. It is more wear-resisting and softer. 39cm - 41cm. Universal Car Steering Wheel Cover. 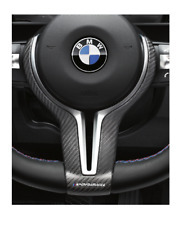 This is the M2 Matt Carbon Trim to fit M Performance Flat Bottom Steering Wheel (32302413014). BMW 2 Series 2019 F22 [2012-2019] Coupe 218d Coupe 1995ccm 143HP 105KW (Diesel). BMW 2 Series 2019 F22 [2012-2019] Coupe 218d Coupe 1995ccm 150HP 110KW (Diesel). 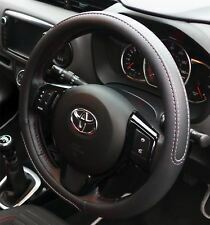 FAUX LEATHER STEERING WHEEL COVER BLACK/WHITE. Replacing a worn steering wheel is expensive. Get a custom look and save a lot of cash by grabbing one of these covers. Looks and feels like real leather. This is the M3/M4 Gloss Carbon Trim to fit M Performance Flat Bottom Steering Wheel (32302413014). AN INTRODUCTION TO COTSWOLD MOTOR GROUP. Currently owned by two share holders, Peter Harris and Andrew Hulcoop (Managing Director). 1 Soft Leather, Mould proof, Breathe freely and absorb Sweat. 2 This steering wheel cover will protect and prevent wear on your original steering wheel. Steering wheel cover material: Genuine Leather. Chunky Sports Grip Steering Wheel Glove. UNIVERSAL, SO WILL FIT MOST STEERING WHEELS. ADD THAT SPECIAL TOUCH TO YOUR CAR! Black & Red. Protects and enhances the look of your car interior. VERY SOFT GRIP. HIGH QUALITY LEATHER. 38cm Car PU Leather Steering Wheel Cover Anti-slip Protector SY !